Organic beans make up nearly 1% of organic produce sales, and their appeal is growing. Sales rose by almost 30% in 2016, and accounted for more than 7% of category sales. Organic beans appeal to health-conscious consumers who are looking for sustainably grown produce. Vegan and vegetarian diets use beans as a meat replacement, so be sure to target those niche consumers, too. For more information on variety characteristics, visit our conventional beans page. Include bacon bits and almondine sauce in promotions with organic green beans. Promote beans as a great addition to soups during the winter. 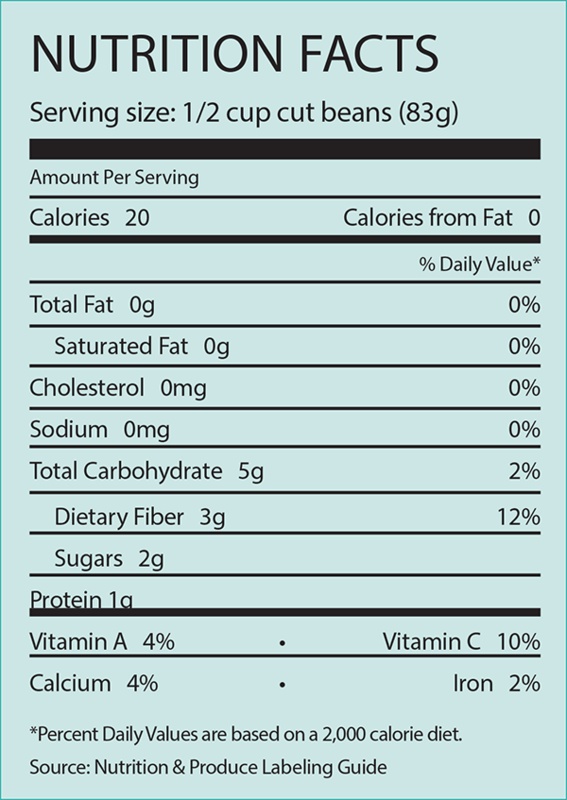 Beans are popular around the winter holidays, so include organic beans in holiday meal promotions. Include organic beans in Easter and Mother’s Day promotions. Grilling promotions are another great way to move organic beans. Green beans and yellow beans are the most common types of organic beans available to consumers. Create a display in your cooking vegetables section using bagged organic green beans. This will avoid mixing with conventional green or yellow beans. Organic green and yellow beans are often shipped in microwaveable bags. Use the colorful packaging to draw consumers to the display. Organic green and yellow beans are most often sold in microwaveable bags. Sizes range from 10 ounces to 2 pounds. With the wide range of color shades available, color alone is not an indication of freeze damage. Look for russeting and other patterns of discoloration, especially on the tips. Highly sensitive to freezing injury. Susceptible to chilling injury. Damage sometimes is not apparent until the produce is returned to a higher temperature. Snap beans are subject to chill injury and russeting if held at temperatures below 40 F, 4.4 C.
Damage may begin to show within three days. They also will become pitted and lose moisture rapidly. Snap bean containers should be stacked to allow maximum air circulation. To retain moisture content, wash beans before refrigeration.